The top 3 red arrows point to the cancels that are the same on both stamps. The interesting part is the addition of the curls added to the bottom. 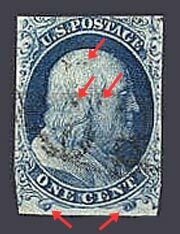 (lower 2 arrows) This in and of itself does not make this stamp a Scott 5, but "schuylerac" probably didn't know that. It should also be noted that the left and right edges were trimmed. 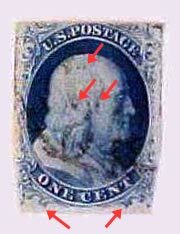 Perhaps to hide the other design features that separate Scott 7's from 5's? THIS COULD BE GENUINE AND NEITHER SHOULD YOU. THIS BEAUTY IS SOLD AS IS!! It was sold for $91.00 to the reseller "ahneve", who offered it "as is" on 4 May 2002 for $9.99 as item 1350905147, but ended the auction just before it closed due to lack of significant bids.